No, not aeroplanes – coaches. 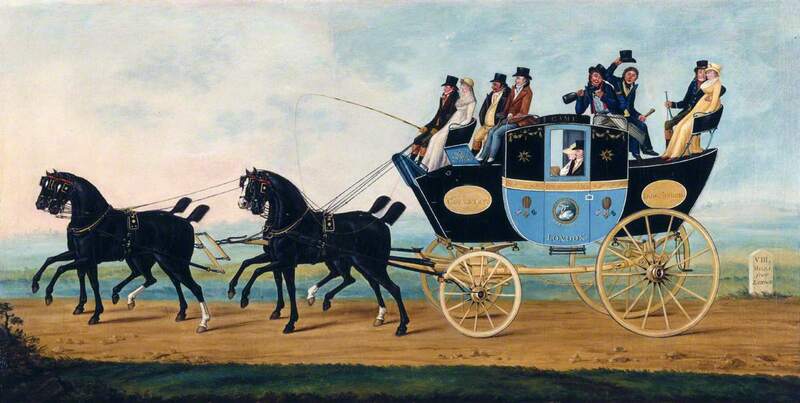 The concept of flying coaches seems to date back to the late 1600s when there were advertisements in the newspapers for lengthy journeys being undertaken by means of these. Looking at these adverts there must have been coaches crisscrossing the country all day every day, so we thought we would share a few with you. Nottingham Flying Coach in two days twice every week. Sets out from Nottingham every Tuesday and Thursday morning at 4 o’clock and will be at the Ram Inn West Smithfield, London the next day, and set out from The Ram Inn, West Smithfield, every Tuesday and Thursday. Performed if God permit, by Charles Hood, Richard Tuffin and Edward Wilkinson. 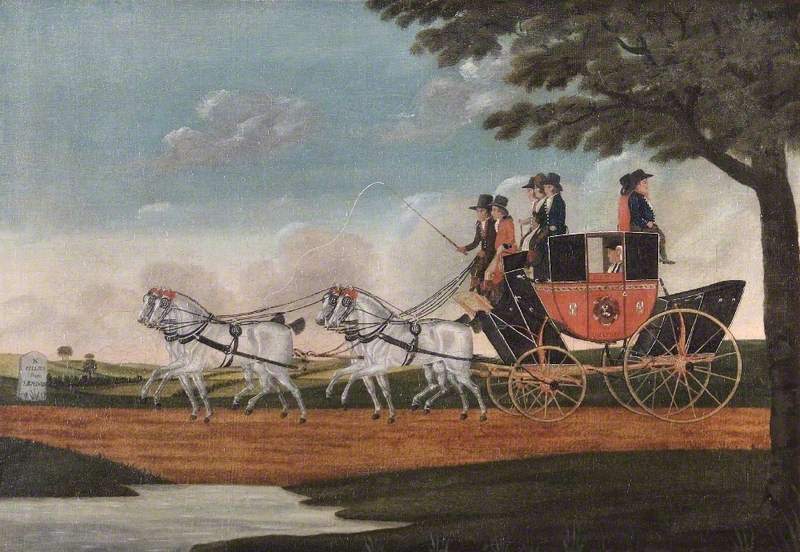 Daventry Flying stage-coach in one day with three sets of able horses. Begins on Saturday 17th April from The Ram Inn in West-Smithfield, London to Mr James Pratt’s at The Black Boy, Daventry; and returns to The Ram Inn in West-Smithfield on Mondays and will continue all the Summer Season, at Fifteen Shillings each passenger. The coach sets out at Two in the morning precisely. 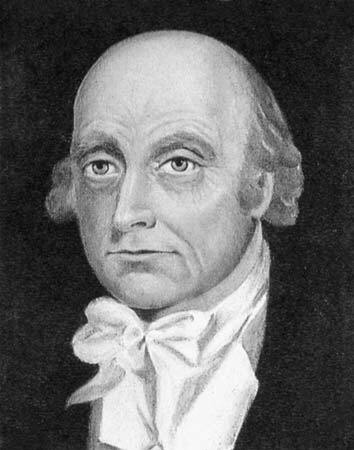 Performed, if God permit, by Thomas Smith. British (English) School; Francis Blewitt’s Coach, ‘The Abingdon Machine’, on Its First Journey from London; Abingdon Town Council; Dated 1767, however, according to this advert below, the first journey was in fact made in 1761. Ten Shillings: children in lap and outside passengers Five Shillings. 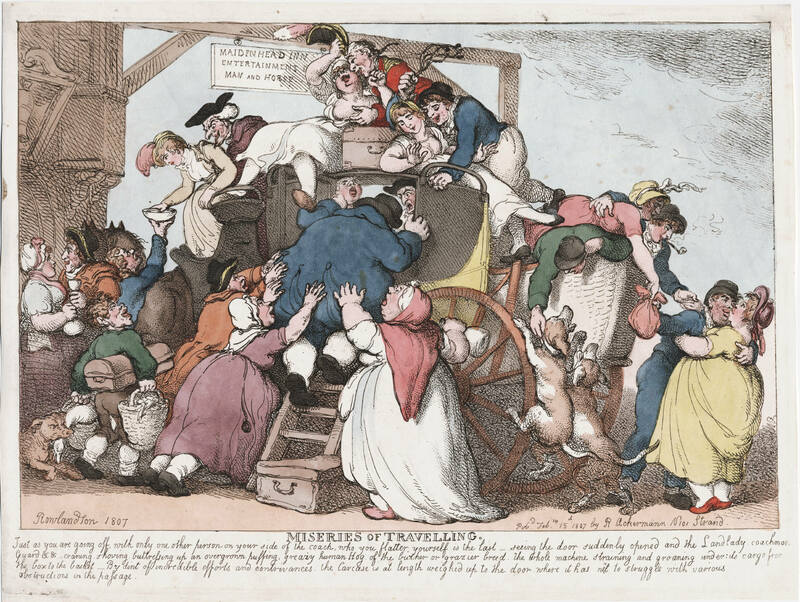 Inside passengers are allowed to carry Fourteen Pounds in weight, all above to pay for. N.B No plate, jewels, writings or other things of great value to be paid for, if left, unless entered and paid for as such. Performed, if God permits by Francis Blewitt. Bew’s flying machine to London was advertised, again travelling three time a week. Sets out from The Bear Inn, in the High Street, Oxford, every Monday, Wednesday and Friday, to The Black Bull Inn, in Holborn; and returns to Oxford every Tuesday, Thursday and Saturday. Sets out at six o’clock in the morning. These coaches were built to carry four passengers inside and no more than six riding on top, but like public transport today there was over crowding, so a contraption was added to the rear, which was a type of basket, known as the rumble tumble that designed to carry the luggage. 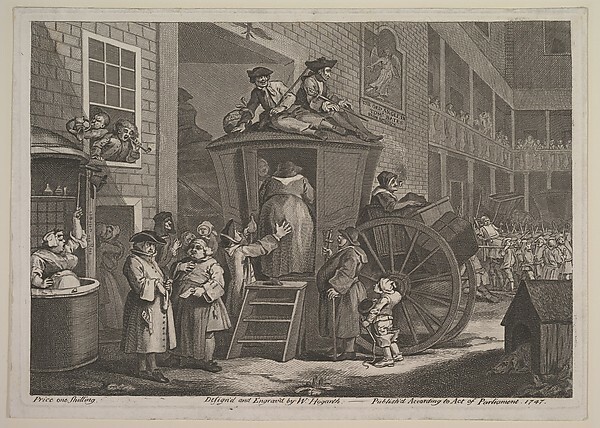 It was not meant to carry passengers, but as you can see from this picture by Hogarth perhaps it did, but it would have been extremely uncomfortable, worse than riding inside with no springs or on top where you would have been exposed to the elements. 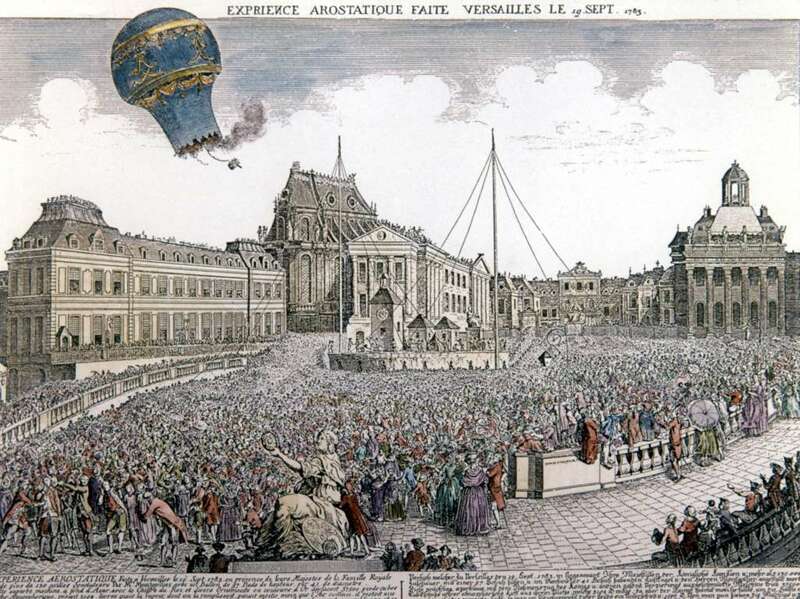 Hot air ballooning was very much in fashion in the 1780s and most people know the Montgolfier Brothers made the first hot air balloon flights in France in 1783. 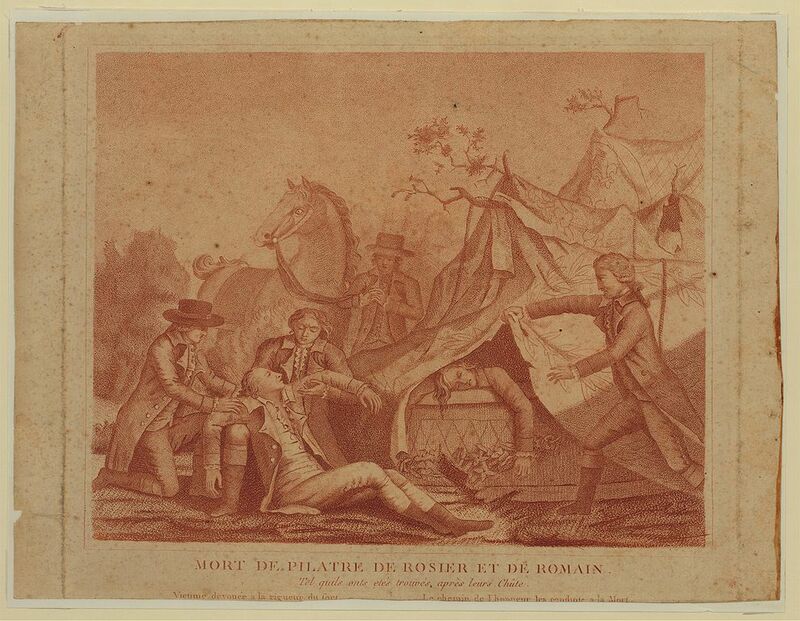 We also know from our previous blog that the first men who died in a manned hot air flight were Jean-François Pilâtre de Rozier and Pierre Romain in 1785. 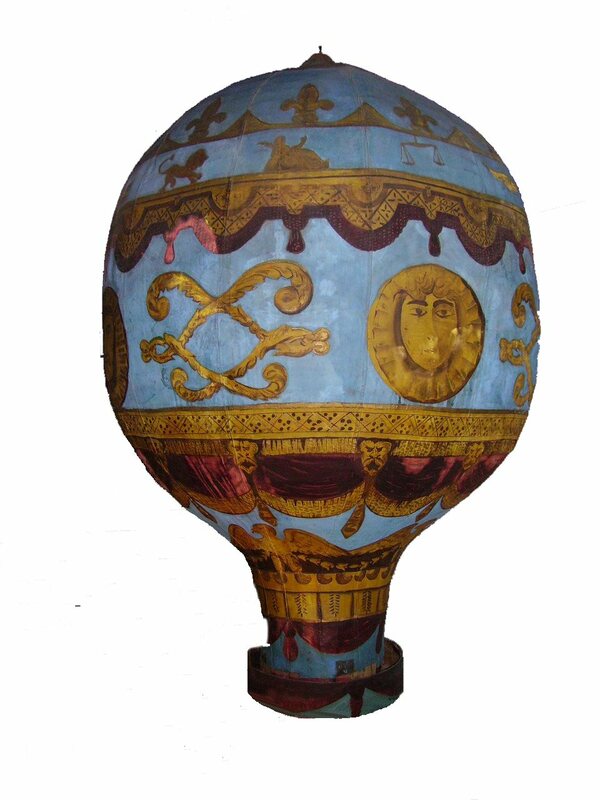 However, across the other side of the world, a year earlier according to the St James Chronicle of 28th August 1784, a young man aged just 13, by the name of Edward Warren was the first person to participate in a US balloon flight. The exact date of this flight seems to vary between the 23rd and 25th June. 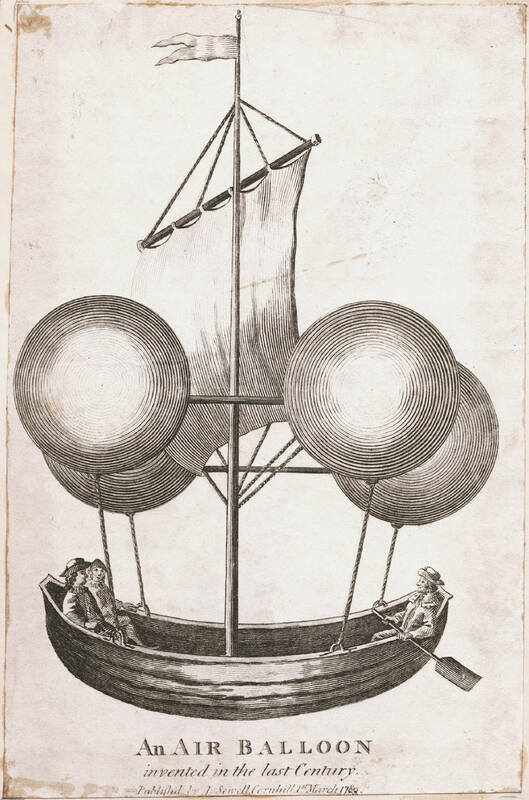 Authentic accounts from Baltimore, in Maryland, mention Mr Carns, an inhabitant of that Town, had constructed several air-balloons which has succeeded beyond expectation. 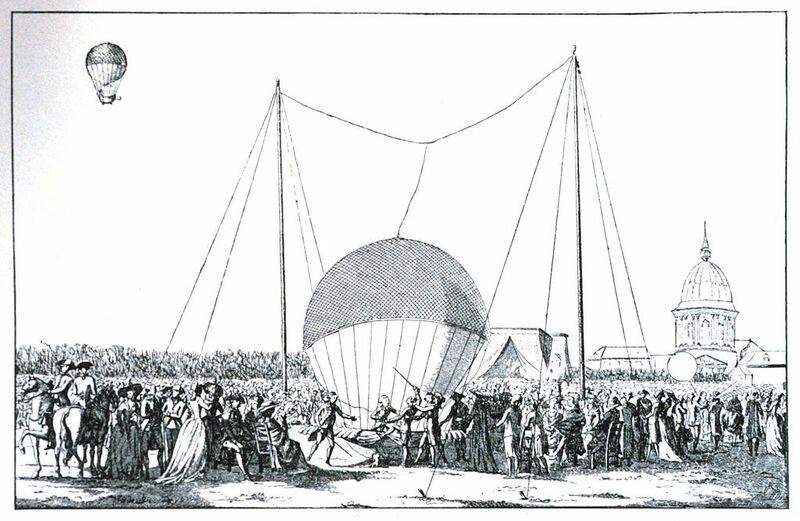 On the 25th June last, he sent up a large aerostatic Globe, to which one Edward Warren, a youth of 13 years of age, was fastened; the balloon went out of sight, and was in the air near two hours, when the weather being exceedingly calm, it descended about two miles from Baltimore, amidst the acclamations of the people, who liberally rewarded the boy for the intrepidity he had shown upon the occasion. Mr Carns apparently wanted to make the attempt himself but was too large for the basket, so Edward was a last minute substitution. We have searched everywhere we can think of to find out what became of the young man, but without success. Do any of our American readers know what became of Edward Warren? 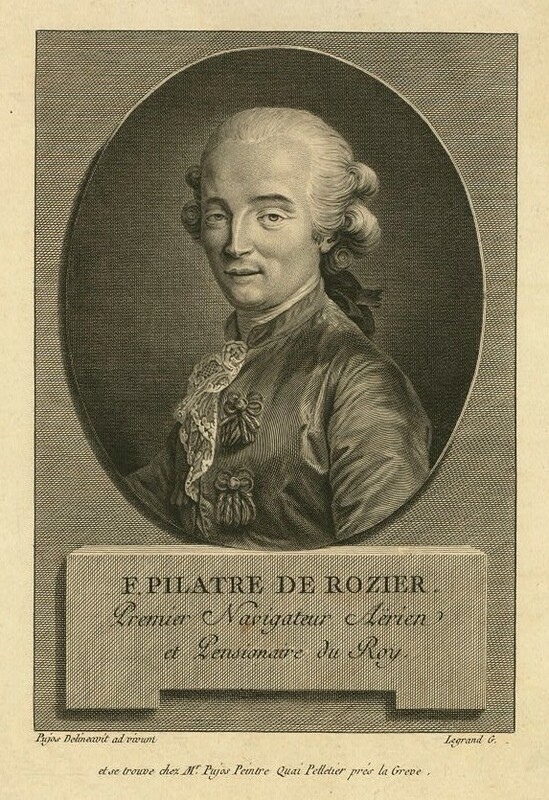 Jean-François Pilâtre de Rozier a French chemist and physics teacher was one of the first pioneers of aviation along with his companion Pierre Romain. However, on Wednesday the 15th June 1785 tragedy stuck when the pair were to find their places in the history books for becoming the first fatalities in an air crash – not quite the accolade they were seeking when trying to cross the English Channel from France to England! An extract from a letter from Boulogne dated 15th June 1785 appeared in The Derby Post and several others the following day giving an account of their tragic deaths. Poor Pilartre de Rozier and a Mons. 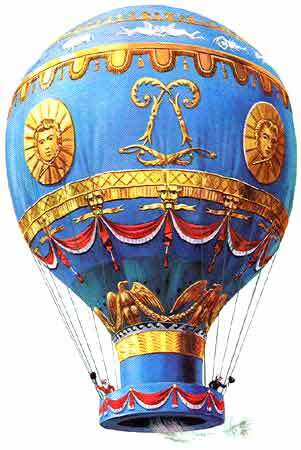 Romain ascended in the grand balloon, at seven this morning, and made a fine appearance in the ascent, bidding fair for a prosperous voyage to England, but in half an hour, when they were at a great height, and about three miles from the town, the balloon caught fire, and of course fell to the ground. The two intrepid adventurers were dashed to pieces. I was with the bodies in half an hour and never saw anything so shocking. I examined the bodies, but do not find anything broke above the middle, so that they must have come down perpendicularly, but their legs and thighs are broke in many places. I shook hands with Rozier almost the last person in his life time; he was a fine young fellow, and thought for several days past had a presentiment of his untimely end in his countenance; he has been indefatigable for this week in preparing his machine – I hope to never hear of another being attempted in this or any other country; but people blame him, as it was owing to the Montgolfier he carried with the balloon, which set it on fire. 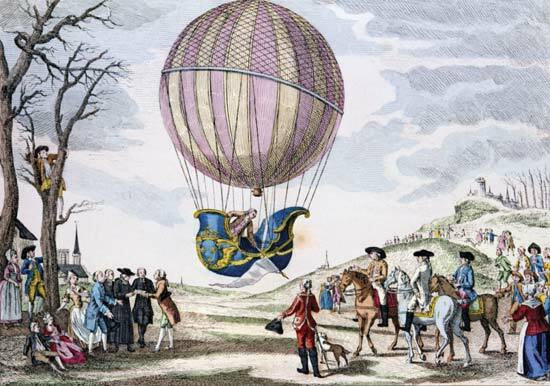 The late celebrated Mr Pilatre de Rozier was the first hardy adventurer, who ascended attached to a fire balloon at Paris on the 15th October 1783, about ten months after Mr. Montgolfier had invented that singular machine. On his return from the sky, he received the compliments due to his courage and activity, having shown to the world, the accomplishment of what had been for ages desired and attempted in vain. It is thought the melancholy exists of M. Pilatre de Rozier and his no less unfortunate companion, will in some measure check the too-soaring ideas of the many candidates for aerial fame, who are now in our metropolis, who had pledged themselves to the public shortly to encounter, at the peril of their existence, the dangers of an element as fickle as it is unknown. 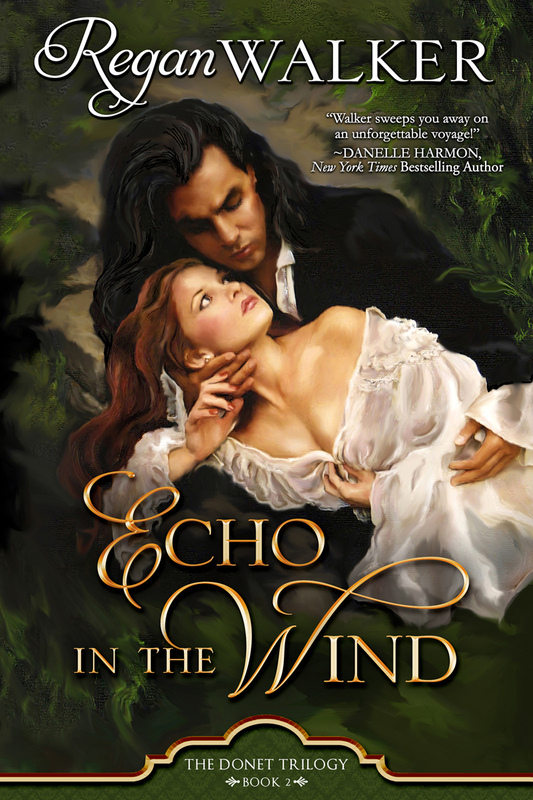 M. Rofier was to have been married immediately on his arrival in England, to a Miss Dyer, a beautiful young lady of great fortune in Yorkshire. Possibly unable to cope with the loss of her fiance, the beautiful and accomplished Miss Susan Dyer apparently died just eight days later at a convent in Boulogne, reports stating that her death was possibly a suicide. however, this seems to have been countered by an article in The Botanic garden by Erasmus Darwin & William Blake written 1825 which states that she ‘lingered for some months and died of grief‘ – perhaps a less dramatic and possibly more accurate account. According to The Morning Chronicle and London Advertiser of the 20th June, Rozier’s companion. Romain did not die immediately but was conscious enough to ask for water just before taking his last breath. Little appears to have been recorded about Romain, however, he was selected for this attempt by Rozier due to his vast knowledge of physics and mechanical power. He was a young man only 27 or 28. 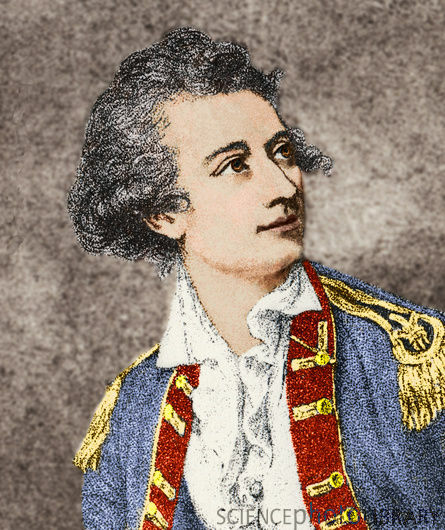 He was described as being of a florid complexion, middle-sized, well built and active. 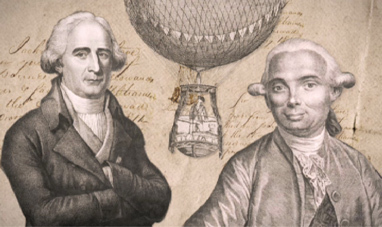 The modern hybrid gas and hot air balloon is named the Roziere balloon after his pioneering design. A commemorative obelisk was later erected at the site of the crash. The King of France had a medal struck and gave his family a pension of 2,000 livres.